SWT’s Mobile Steel Tanks are UL classified for drinking water system components in accordance with NSF/ANSI Standard 61-(1992) 7N44. They are available with polyethylene or Plasite 4110 vinyl ester lining. 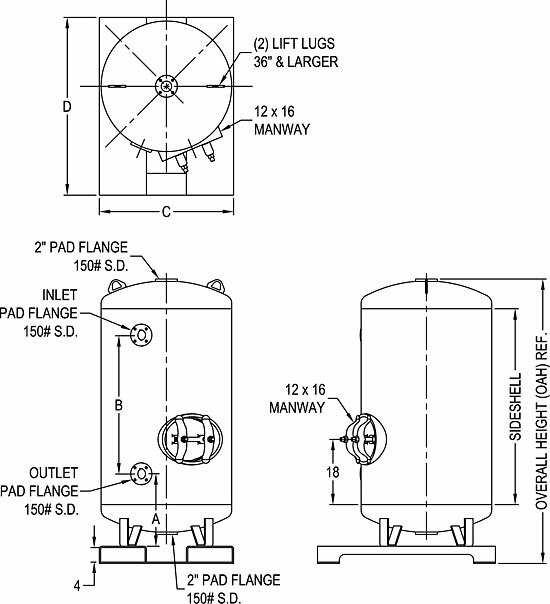 All steel tanks have two 2 inch pad flange top and bottom openings; 2 or 3 inch pad flange inlet and outlet openings located on the side wall of the tank; a 12 x 16 inch manway; and a bolted-on galvanized fork tube base. All tanks larger than 36 inches in diameter come standard with lift lugs. SWT's steel tanks are durable, rustproofed, and built to last. These pressure vessels are available in both non-code and ASME code construction. Made in USA. This fillable PDF form is designed to make everyone's life easier. When requesting new mobile steel tanks, all of the relevant information is included in this easy-to-complete form. 1. Download the PDF form to your computer. 2. Open the form in your PDF Reader application. 3. Fill in the relevant fields (light blue color areas) using your keyboard. 4. Save a copy of the completed form to your computer. 5. Email the completed copy to info@swtwater.com, and we'll process your request lickety-split and get back to you with the pertinent follow-up information. (?) Substitute B for safety blue epoxy finish coat; or W for white epoxy finish coat. Example: UQ-2460MPE-2B is 24 x 60 blue colored mobile steel tank with polyethylene lining. * Head Volume includes the straight flange of the head. Example: UQ-2460MPE-2B-ASME is 24 x 60 blue colored ASME code mobile steel tank with polyethylene lining.